Improve your store checkout process and increase your sales today. Apply less effort and get more customers! Increase conversion rate by speed up page response time up to 400%! Based on core Magento features that support both static and dynamic blocks. Make your Magento mobile friendly. Optimized layered navigation for mobile devices. Fast and efficient checkout layout. For the latest news and products releases, special offers and exclusive discounts, simply fill in your email address below and hit submit. * Your information will only be used for our newsletter. 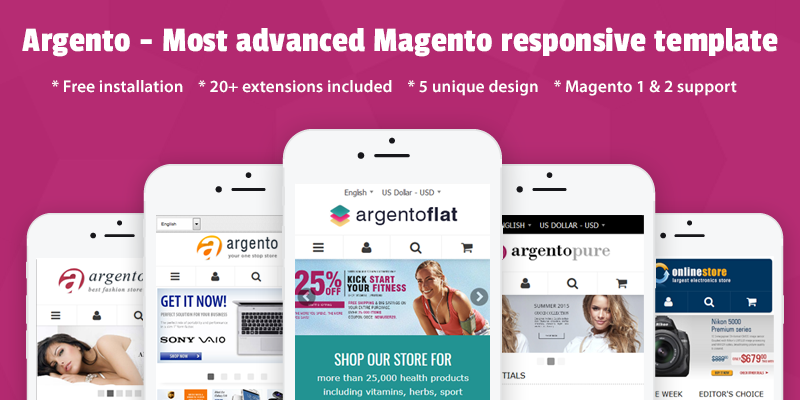 Templates-Master.com is leading provider of Magento themes and extensions.. Our most popular theme is Argento responsive theme. It works both with Magento 1 and Magento 2. Right now you have choice from more than 60 unique templates and 42 modules created right out of the scratch and according to Magento development guidelines. All our templates are based on improved HTML structure and build with SEO in mind. We do constantly updates our products in order to make sure that our products can be use with recent Magento releases. Right now all our skins works with recent Magento 1.9 release and previous Magento versions. Magento community keeps growing everyday and our team constantly helps it by providing free Magento skins and plugins. We created most popular free templates such as Magento Classic theme and Magento Absolute template. Both this templates were already downloaded more than 200 000 times. For last 4 years we have published more than 15 releases and updates and answered thousands of support request related to that themes. So if you want just to try Magento then it’s right way start. We do understand that Magento is powerful and complex ecommerce platform. That is why we offer "Free installation services" for any commercial theme or module bought at our store. Our specialist will install ordered themes and modules within 48 hours after placing your order. That’s guarantee that our products can be even installed on highly customized Magento stores. Our support team is fanatic when it comes to making our clients happy. More than 33 000 clients already used our services for last 5 years and you can find our what they think about our services at Magento connect and on customers reviews pages submitted for our products. So if you have any problem with our product then don’t hesitate to contact our team. When you buy any product at our store you get 1 year of free updates and support. Thats guarantee that our themes and modules will bring maximum profit for your business and you will not be alone when you will face any problem using our themes and extensions. You can sign out for our Twitter and Facebook accounts in order to get notification about recent updates and special offers. Have a feature or suggestion? Every great product comes from a small prototype. That is why our developers are constantly working on new features and modules that could help our customers. The more we know about store owners needs, the better we will do. Therefore, if you are already using our products or just want to buy it, but need a new feature or a completely new product, then don't hesitate and contact our team. We are always open to new ideas!! Join us on Facebook or Twitter and get recent updates and promotion from our team. You have nothing to worry about. Since initial Magento Release in 2008 our team provides Magento modules and extensions. We serve more than 35 000 clients world wide! We provide ready-made solutions to help launch your Magento store quickly and easily. All our templates and extensions are specially designed for Magento and are completely customizable. Our support specialists are focused on deliveryng best technical support and guidance. In order to help Magento community we do support bunch of free themes and extensions.